The Weigh Safe Tow hitch is an excellent piece of equipment for people who value their safety. It is essentially your standard two hitch but with the ability to tell you if your tongue weight load is too heavy or not. 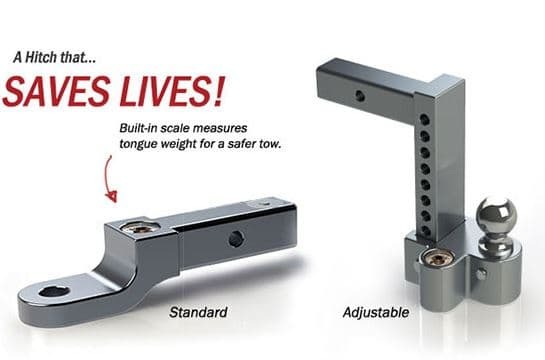 Having an overly heavy tongue weight can cause whatever is trailing you to sway when driving or even break the hitch and release doing tons of damage. This product can save your life in so many different ways and is an invaluable tool to have when it comes down to it. From 1988 to 2011 there were 10,691 deaths and 323,708 injuries involving trailer hitch accidents. While those numbers aren’t too awfully scary that means it does happen often enough that you or someone you might know accidentally loads up too much and their hitch breaks or fails to keep the load in place and it slides into their car or releases into the car behind them. You definitely don’t want to be the reason that your load hurts someone and with this product you can avoid that with ease, avoiding guess work in favor of simply knowing one way or another if your load is safe. The product has been winning awards since its release because of the amazing amounts of safety it provides. The hitch is a fantastic product that is getting out into the world and getting tons of attention with plenty of people absolutely loving it. Its price for saving your life is fairly cheap with its lowest cost being only $100. $100 to save your life is an exceptionally cheap price to pay. A product like the Weigh Safe Tow Hitch is useful for anyone who ever tows anything be it for work or for their own personal need. The value of safety is something you simply can’t put a price on and with a hitch that makes safety a lot easier to obtain you can’t pass up the offer. No one wants to be the person who’s caught without this hitch injuring someone or pushing traffic to a dead stop at their luckiest when they made a mistake on determining if their truck could handle a particular load or not. This hitch is going to save a ton of lives and be a great thing to have in our world and the maker couldn’t have done a better job.